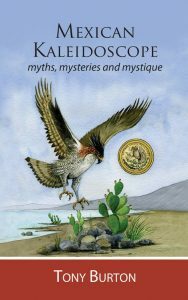 I recently had a chat with geographer and author Tony Burton about his latest book Mexican Kaleidoscope: myths, mysteries, and mystique (Sombrero Books, 2016, 165 pages), a wide-ranging collection of informative and often surprising vignettes gathered from Mexico’s rich history and culture. Tony’s unique book brings to light many little-known facts about this fascinating country and its people. A copy belongs on the bookshelf of every serious Mexicophile. JM: You have been writing about Mexico for many years, what first got you interested in the country? The following post is courtesy of the wonderfully talented, Cristina Potters. Her blog (Mexico Cooks!) is incredibly successful and we are proud to have her as a contributor to share her knowledge, recipes, and gastronomical expertise about Mexico. Mexico Cooks! couldn’t start the month of September without paying tribute to our iconic chiles en nogada (chiles in walnut sauce), the Mexican flag on your plate. Mexico celebrates its independence the entire month of September with parades, parties, and traditional food and drink in restaurants and at home. 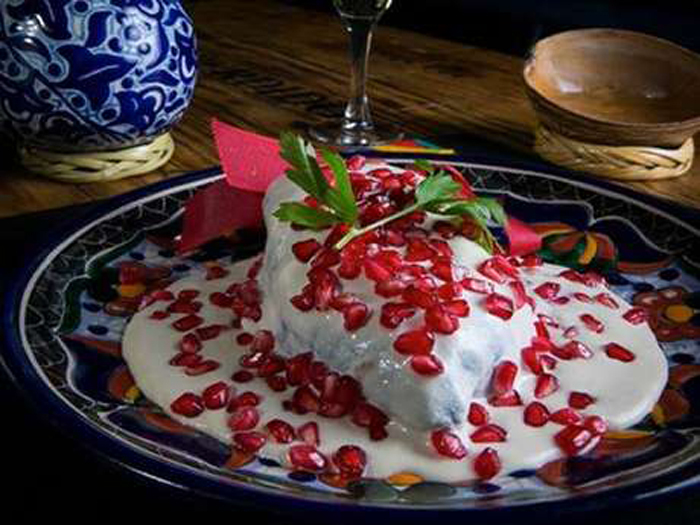 The traditional festive dish during the weeks before and after the Independence Day holiday is chiles en nogada, a magnificent tribute to the seasonal availability of granadas (pomegranates) and walnuts. 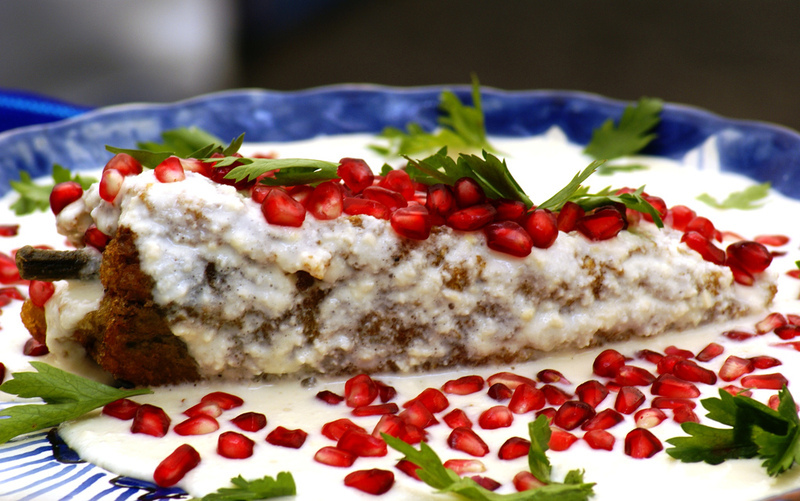 From mid- August till mid-October, fresh pomegranates and walnuts make chiles en nogada possible. 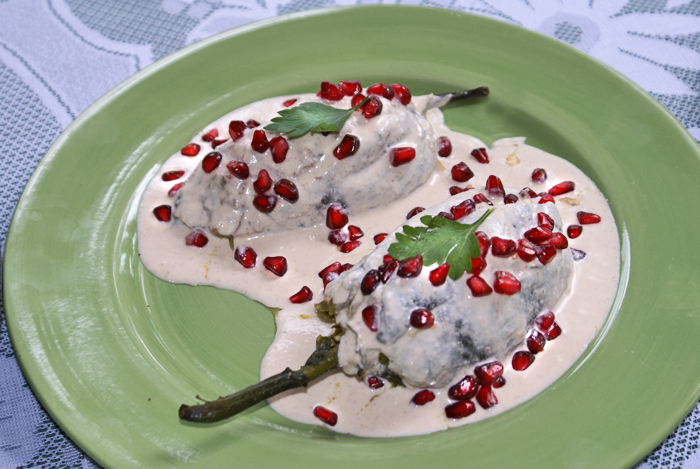 Mildly spicy chiles poblano, stuffed with picadillo and topped with richly creamy walnut sauce and pomegranate seeds, flaunt the brilliant green, white and red of the Mexican flag. This festive dish is traditionally served especially on September 15 or 16 in honor of Mexico’s Independence Day, though it is popular anytime in the late summer and early fall. During August and September in the highlands of Mexico, particularly in Mexico City and Puebla, the dish is very popular. On streets bordering city markets and tianguis (street markets), you will see village women sitting on blankets painstakingly cracking open nutshells and peeling the thin brown skin from each freshly harvested walnut. It is important to use the freshest walnuts possible, as they produce such a creamy, rich sauce that it is worth the effort demanded to peel them. Yes, the recipe is time-consuming…but you and your guests will jump up and shout “VIVA!” when you’ve licked the platters clean. 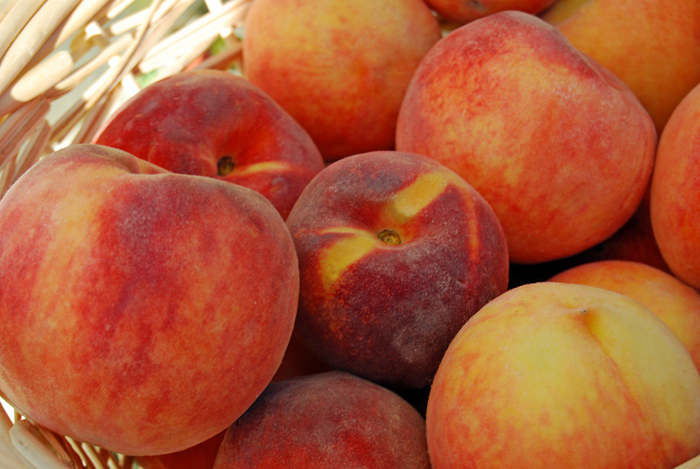 Fresh peaches, in season now. Biznaga cristalizada (candied barrel cactus). Chiles poblano. Choose the largest chiles with the smoothest sides for easy roasting. Newly harvested, freshly peeled walnuts. 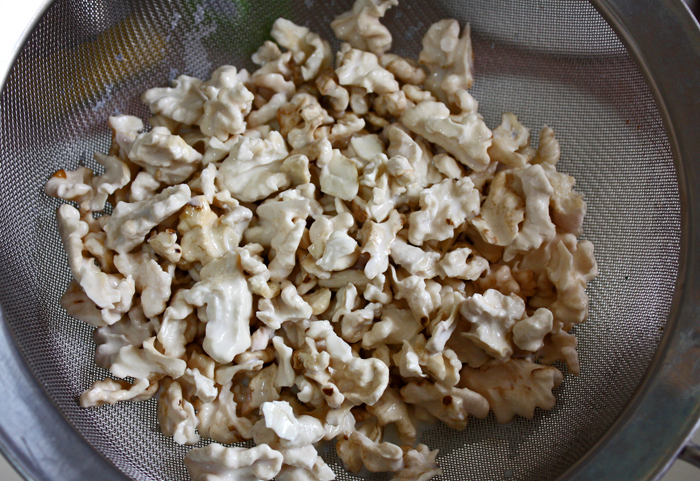 All of the shell and the thin brown skin must be removed to make smooth, creamy-white nogada (walnut sauce). Photo courtesy Gabriela. 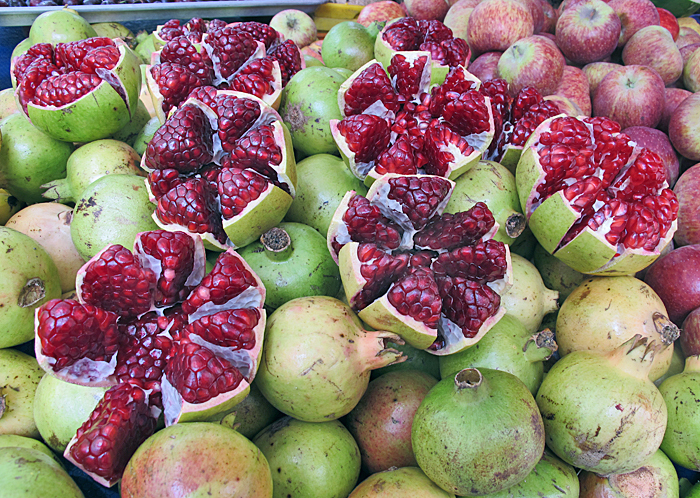 Fresh, seasonal pomegranates, available now in Mexico’s markets. 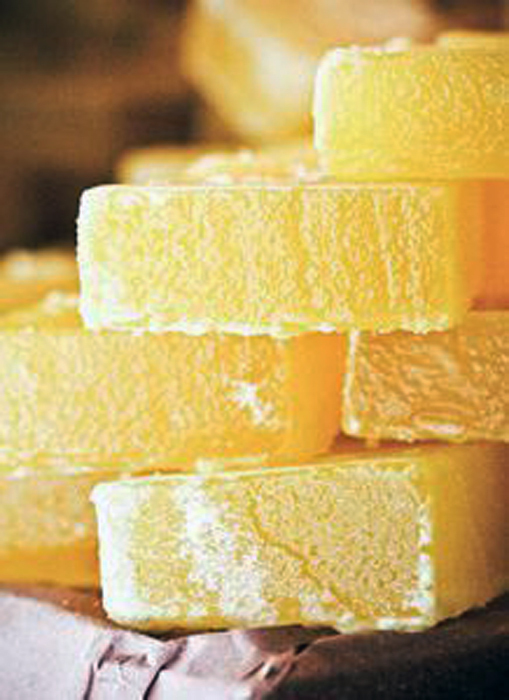 Cut the meat into large chunks, removing any excess fat. Place the meat into a large Dutch oven with the onion, garlic, and salt. Cover with cold water and bring to a boil over medium-high heat. Skim off any foam that collects on the surface. Lower the heat and allow the water to simmer about 45 minutes, until the meat is just tender. Take the pot off the stove and let the meat cool in the broth. Remove the pieces of meat and finely shred them. Warm the oil in a large, heavy skillet and sauté the onion and garlic over medium heat until they turn a pale gold. Stir in the shredded meat and cook for 5 minutes. Add the cinnamon, pepper, and cloves, then, stir in the raisins, the 2 Tablespoons chopped walnuts. Add the chopped pear, apple, and potato, and mix well. Add the tomatoes and salt to taste, and continue cooking over medium-high heat until most of the moisture has evaporated. Stir often so that the mixture doesn’t stick. Let cool, cover, and set aside. The picadillo may be made 1 day in advance. Make a slit down the side of each chile, just long enough to remove the seeds and veins. Keep the stem end intact. Drain the chiles on absorbent paper until completely dry. Cover and set aside. The chiles may be prepared a day in advance. At least 3 hours in advance, place the 1 cup walnuts in a small pan of boiling water. Remove from the heat and let them sit for 5 minutes. Drain the nuts and, when cool, rub off as much of the dark skin as possible. Chop into small pieces. Place the nuts, cream cheese, crema, and salt in a blender and purée thoroughly. Stir in the optional sugar, cinnamon, and sherry, if using, until thoroughly combined. Reserve at room temperature. The stuffed chiles pictured above were dipped into an egg coating and fried prior to finishing with walnut sauce and garnishes. 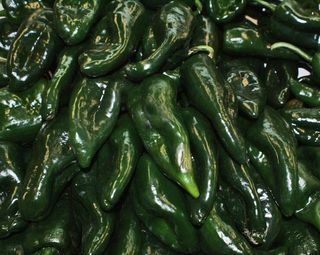 In Mexico, passionate diners argue the pros and cons of coating the chiles; many insist that coating and frying is not traditional, and many insist that it is. Mexico Cooks! prefers chiles en nogada with no coating. Chiles en nogada as presented at Restaurante Azul/Histórico, Mexico City. 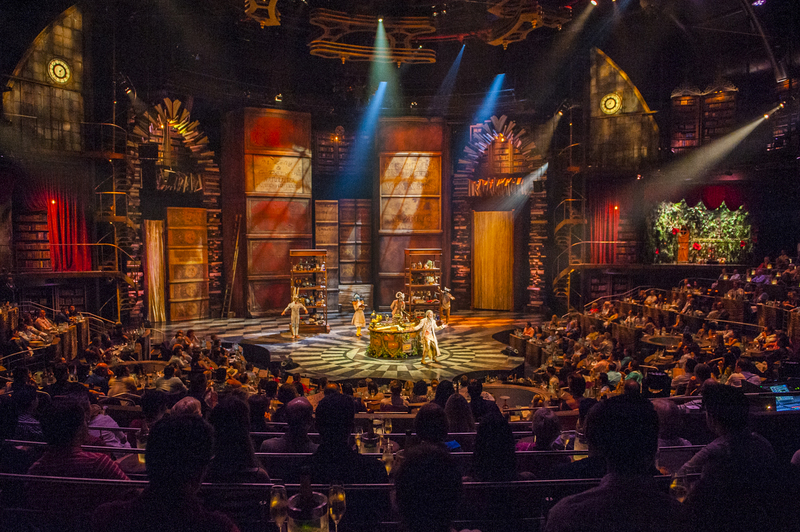 This beautiful service is only surpassed by the flavors of the chiles. This dish may be served at room temperature, or it may be served chilled. Note: Many people in today’s busy world prefer to make this recipe using a mixture of ground rather than shredded beef and pork. Using this quick method, simply brown the ground meats and add the rest of the picadillo ingredients once the meats are browned. The results will be excellent! 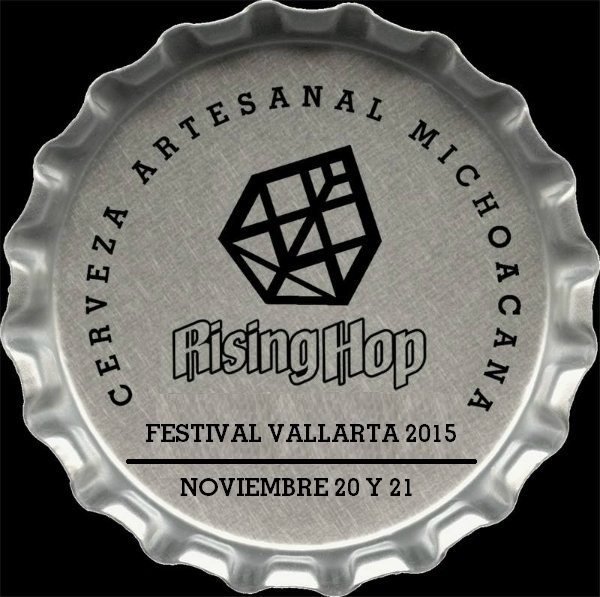 To read more from Cristina, visit Mexico Cooks! The newest trend in travel includes retreats customized and styled for you. 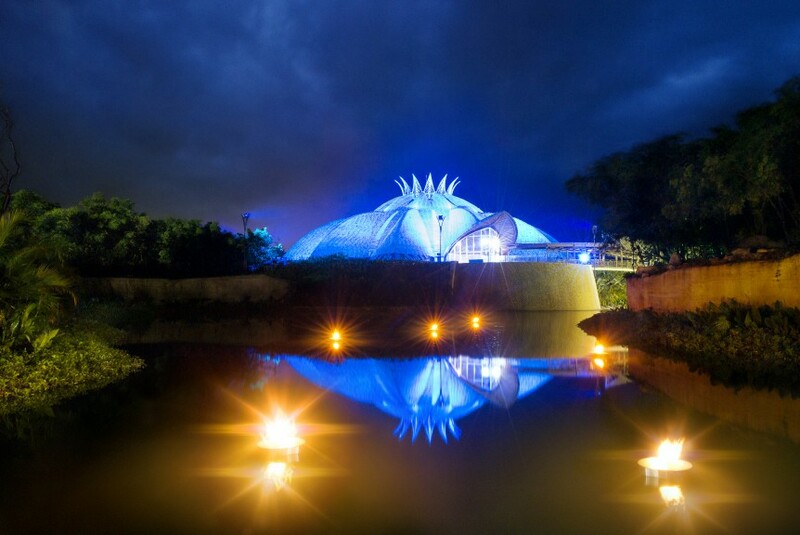 360Retreats, located in Mexico and the US, create exciting experiences for companies and travelers who want to take their vacation one step further with a vacation for the mind, body and soul. 360Retreats was born out of an idea to create customized retreats that fuel the body, ignite the soul and provide rich cultural experiences. But what sets 360 apart is that they not only plan and lead their own retreats, they plan retreats for companies so that the company can focus on their client or staff goals, all while 360 takes care of the rest. Retreats are no joke when it comes to benefits, but anyone who has planned and led one understands that they are complex logistical creatures. 360’s goal is to make it simple for you so that you can gain the maximum benefits! 360 is receiving requests from a variety of potential partners including fitness studios, spas and companies interested in professional development retreats for their staff. 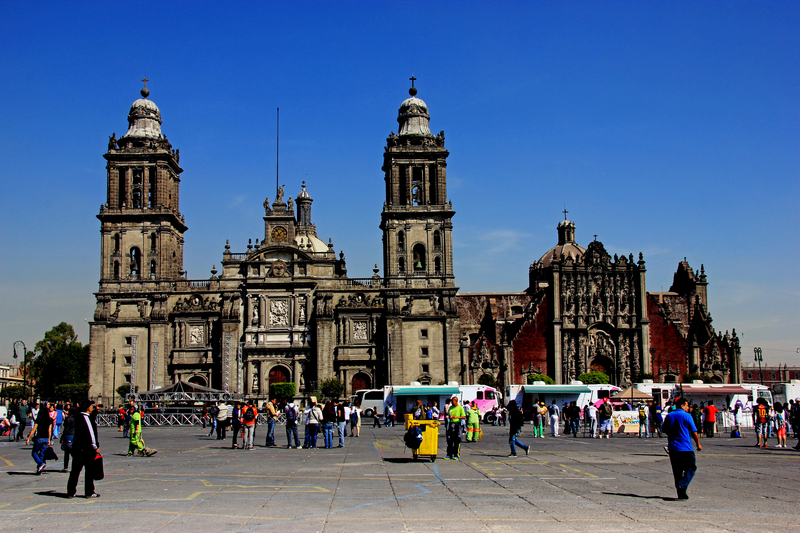 Their geographical expertise crosses Mexico, so start thinking about what setting fits your needs. Perhaps a boutique hotel surrounded by the aqua blue Caribbean, an eco-chic cabaña with a lush tropical jungle view or a mountain retreat with morning hikes and hot springs on the daily agenda. Of course you are wondering about their fees…. Well, get this – if you partner with 360 you will pay nothing and possibly even earn money depending on your arrangement and needs! It’s simple and straight forward and starts with you filling out a questionnaire. Then expect a personal call from Molly or Katherine Fisher (360 co-founders and sisters) to start working on the details. Molly and Katherine also want to share their personal Mexico favorites with you, their treasured guest. Guests are bound to have their senses awakened with daily fitness classes, unique adventures such as a pyramid tour, a visit to a local hot springs, or a stand up paddle board session. And of course there are cultural activities that range from salsa dancing to preparing fresh local cuisine using native plants to creating an art piece with a local artisan. There is truly something for everyone! Whether on a Partner or Signature Retreat you can expect to experience another culture while reenergizing with fitness activities and indulging in fresh local food all while being surrounded by stunning and serene landscapes. Molly and Katherine are excited to share their journey with you. You can read more about them and 360 on their blog. — 360Retreats gives back a portion of their proceeds to further their mission.